A meeting between Gazprom’s Management Committee Chairman, Alexey Miller, and the heads of Russian pipe companies took place today in St. Petersburg. Attendees included Alexey Mordashov (Chairman of the Severstal Board of Directors), Dmitry Pumpyansky (Chairman of the TMK Board of Directors), Andrey Komarov (Member of the Chelyabinsk Pipe Rolling Plant Board of Directors), Vladimir Markin (President of United Metallurgical Company – OMK), and Ivan Shabalov (Chairman of the Pipe Producers Association Co-ordinating Council). 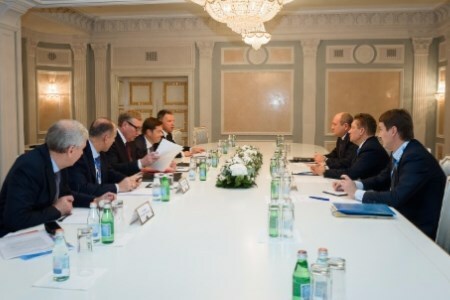 At the meeting, it was noted that the long standing co-operation between Gazprom and Russian pipe producers allowed the manufactures to start the production of high quality products. With the current technological level, domestic pipe companies may be able to compete successfully for pipe supply contracts on Gazprom's major international projects.